He holds up a tiny cell phone screen—my iPhone is a small TV in comparison—that displays a black 1000 on a pale blue background. And then I’m gliding over black asphalt, punching a hole in the dust choked air, inches away from cars, buses, disaster. On the back of the moto, I have no control: I can only lean as the bike is lowered into turns, tuck my legs as we shoot between cars, and hold my breath as my driver takes an unexpectedly dangerous line. The danger is very real. I have to fully trust this man. This man I just met. Who cannot speak English past Hello. 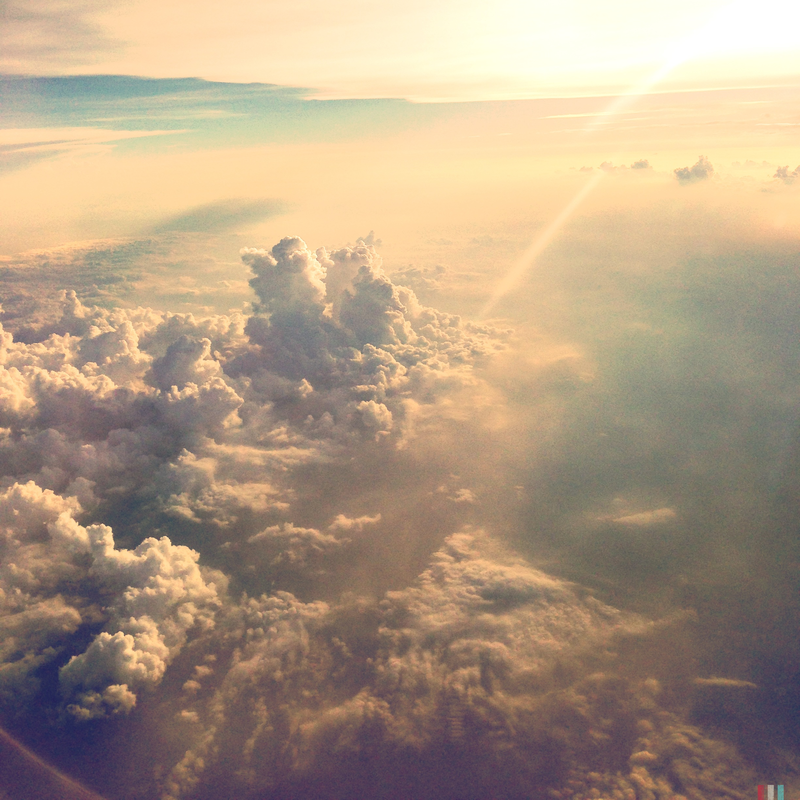 The beginning of our journey, flying over the Pacific Ocean. Dirt roads wind through the arid landscape like exposed arteries, pumping deep red dust across wide hills and shallow valleys—it’s as if Earth itself is alive and I am seeing her heart beating. The blood vessels feed into a blackened backbone of dark asphalt, barely wide enough for two streams of traffic, that runs the length of the city below. As we descend into Kigali—Rwanda’s capital and largest city—I think it strange to land on a runway that might contain more asphalt than the entire city it services. My wife, Katie, and I pick up our bags amid boxes of fruit and an entire set of rubber tires. And by “bags”, I mean bag—just 1 out of 4 made the trip with us. The rest, we are told by a uniformed woman in a tiny baggage claim office, will come tomorrow. We hope. We are greeted in the small arrival terminal by the founder of Play for Hope, Brian Beckman. A lanky 20-something who grew up just outside of Portland, Brian’s sharp features are set in a pensive scowl, like he can’t decide if he is deep in thought or deeply frustrated. The two are not so different, here. Brian started Play for Hope a little over five years ago. Using sports to reach orphans and street kids, they use a Christian message and a small group of devoted coaches to provide the forgotten with their organization’s namesake: hope. And by most accounts, their method has worked, exploding in size over the years—they now supply over 800 kids on 36 teams with professional level training at ten soccer and two basketball facilities. 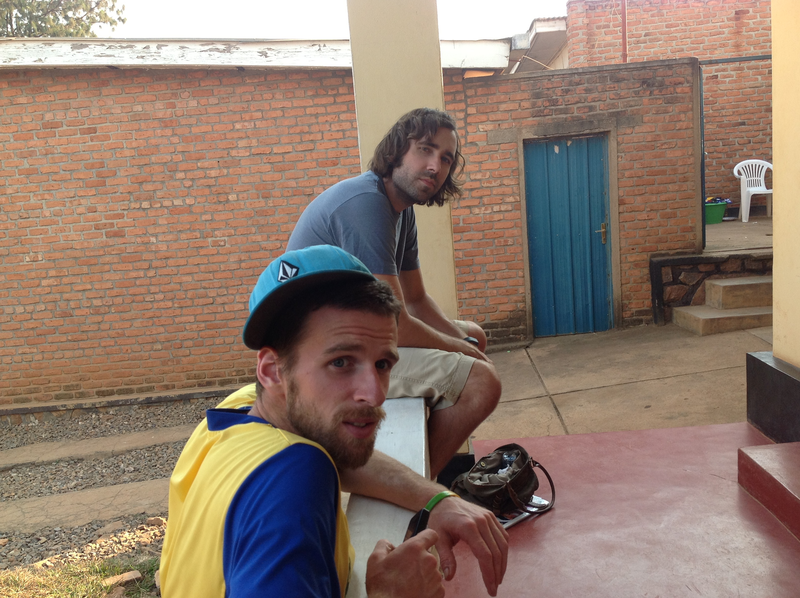 With Brian is Serieux (pronounced like serious), the organization’s local Director, a Rwandan native who has been with the organization from the beginning. Serieux politely says hello in a soft voice as we exchange greetings and walk out of the terminal. It’s my first time stepping onto African soil. It’s midday; the sun hangs directly above us. We’ve just logged 36 travel hours and I’m exhausted. I feel jet lag creeping up on me. The house and its promise of a soft bed calls out to my stiff body, sore from sitting in a cramped airplane seat for hours on end. “The office, I guess,” I find myself saying. 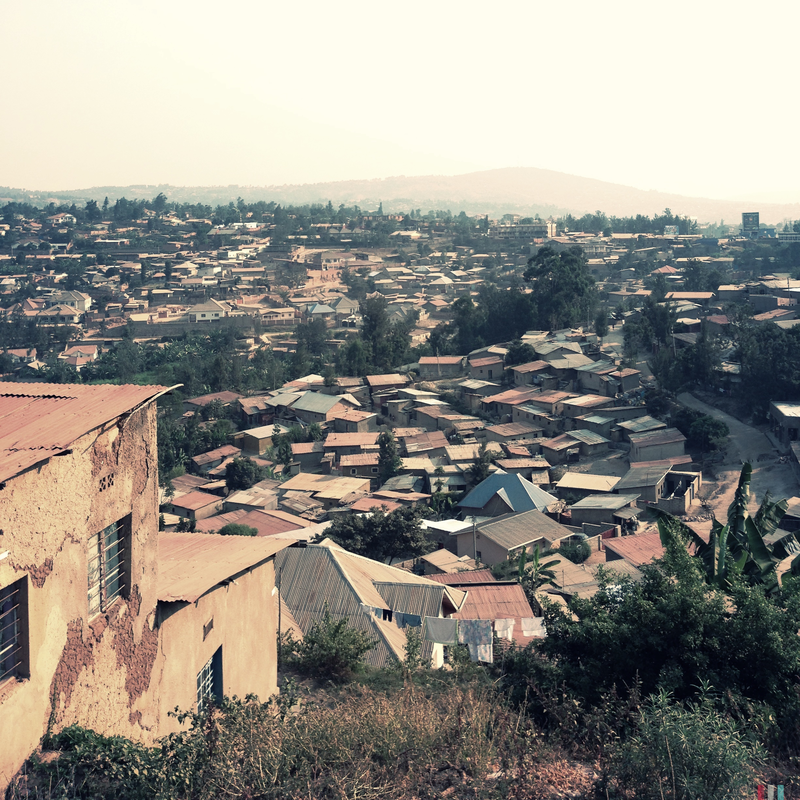 Overlooking a poor section of Kigali, the capital city of Rwanda. 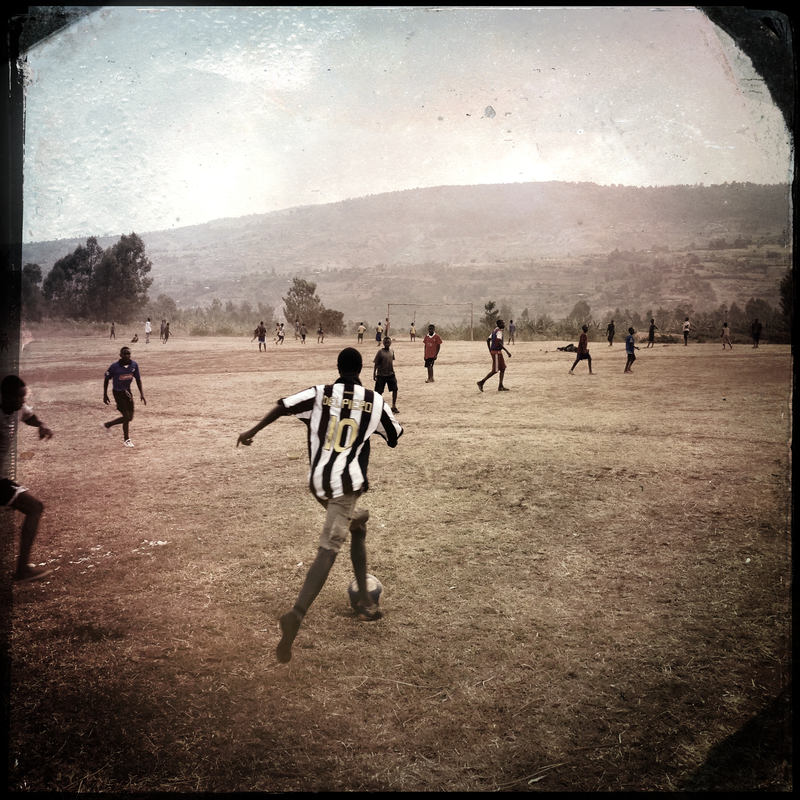 Play for Hope athletes practicing on a field outside of Kigali. I’m seated in a white plastic lawn chair in the middle of a simple office with pale yellow walls. A white door striped with narrow window panes leads outside to a modest courtyard with a small patch of thirsty brown grass; the door is swung open, letting a cool breeze drift lazily in. The walls hold a large punch board filled with photos of smiling kids playing soccer football on dirt fields; a handwritten English alphabet pronunciation guide on pink poster paper; and a photocopied page from an English language workbook that tasks the reader with identifying the location of various things—The cat is under the chair. In the center of the room is a plain desk with two MacBook Pros. 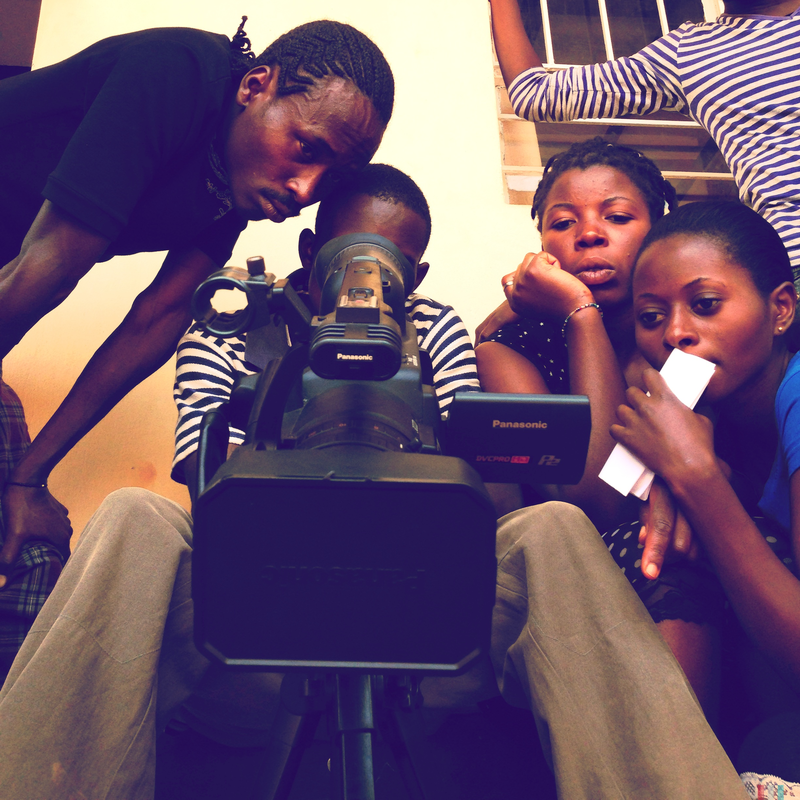 Six Rwandan film students in white plastic lawn chairs encircle the desk, their brows and bodies taut with concentration. Their names are Jimmy, Isaiah, Innocent, Drogba, Stella, and Vanessa, and they are the reason I traveled 7,438 miles from my home in Charlotte, North Carolina. The reason they are here? Some have always dreamed about making movies. Some just love to watch them. But all of them need a way to generate a sustainable income for themselves and, in many cases, their families. In a country where underemployment is 43%, a livable wage is difficult to find. And, believe it or not, video production is big business in Rwanda—it’s common to make in three weddings what the average worker makes in a year. While many of the students are here out of desire, all of them are here out of necessity. Two weeks ago, they didn’t know how to turn on a camera. The very concept of editing video was as foreign to them as their language was to me. 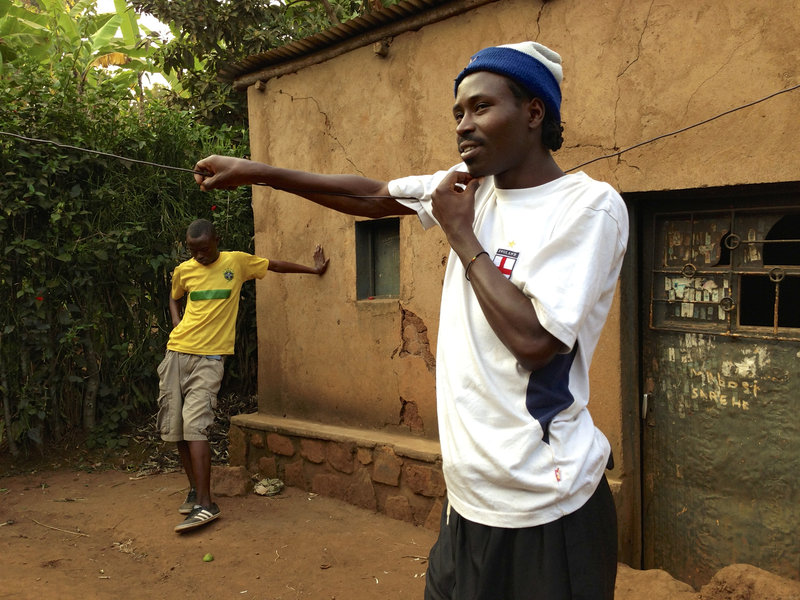 (The common language in Rwanda is Kinyarwanda, which, though partially pronounced exactly like the African country of Kenya, is not actually spoken in Kenya. Which means the name itself is confusing. So, that’s fun.) It’s difficult to convey how much they’ve had to learn. Because of their inexperience with computers, we have had to teach basic concepts, like opening a computer program. We’re essentially teaching them new alphabets, words, and sentences. At the same time. Drogba, Jimmy, Vanessa and Stella viewing their footage. 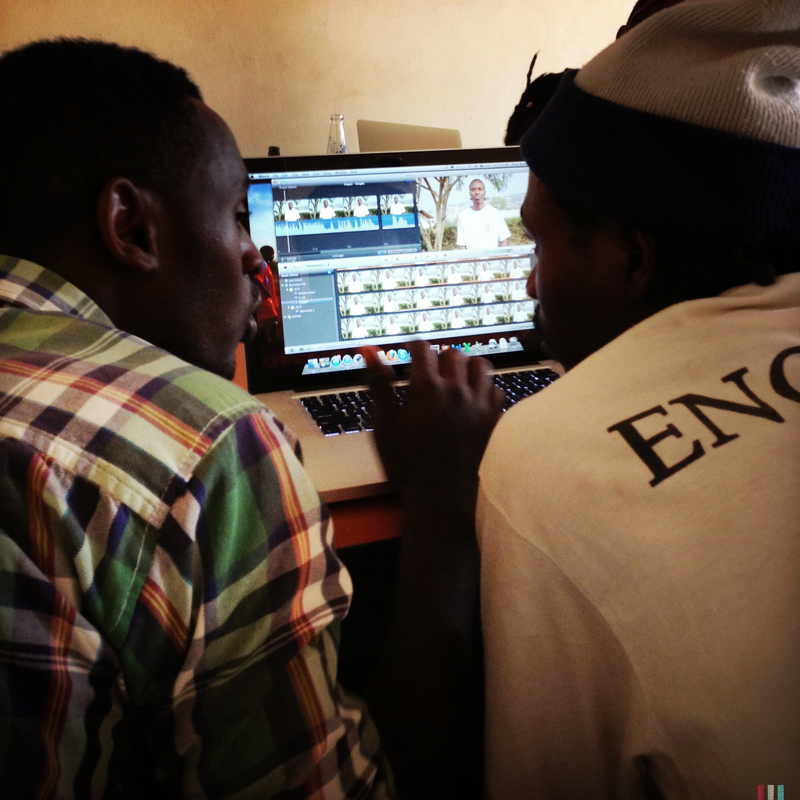 Drogba and Innocent editing their class project. The question pops into my mind while I’m surrounded by a group of laughing kids. It’s the one year anniversary of the Heroes Soccer Academy, a Play For Hope initiative that has taken eighteen at-risk youth off the street, and put them into a house with warm beds, three hot meals a day, and constant mentorship from three dedicated coaches. Just one year prior, some of these kids were in jail—all of them had little hope for the future. We’re in the middle of a theme park, though calling it that is a bit of a stretch—there’s not much of a theme, nor is there much of a park. 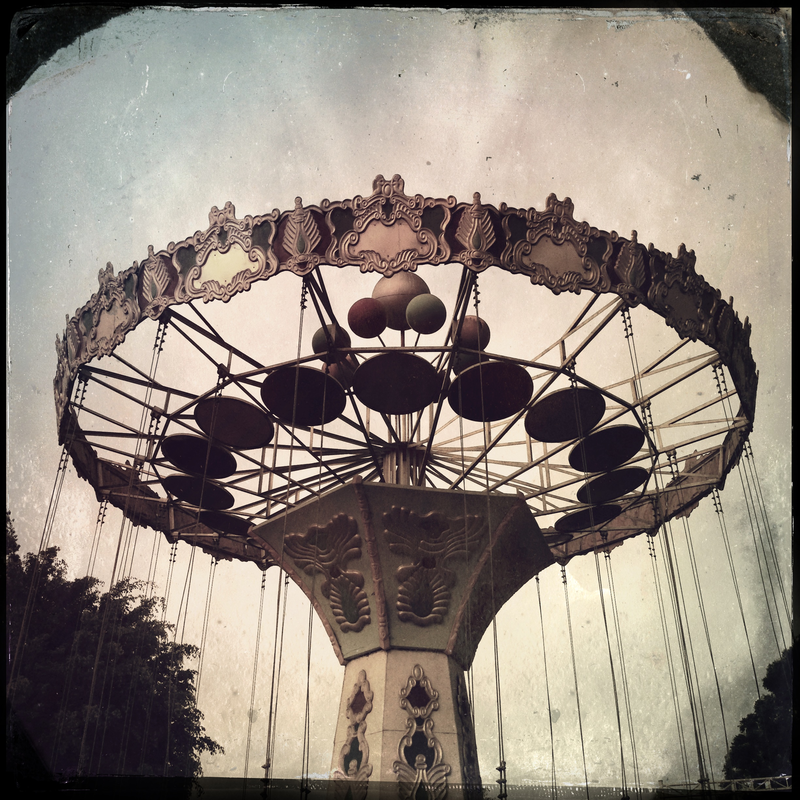 The rides look like leftovers from some forgotten county fair, with fewer coats of paint and a few extra years of neglect, much like the kids clambering into them. Except tonight they have dressed in their finest threads (Rwandans have an affinity for dressing well, which has the unfortunate side effect of masking extreme poverty) and everyone is having the time of their life. Literally, more than likely. As wonderful a night as it is for the kids, it’s also a night full of dissonance: it is hard for me to reconcile their joy with the reality of their circumstances. This is an all too common experience in Africa, where the link between material wealth and happiness is so tenuous it might as well not exist. This is not to say the desire for money is non-existent, nor that the burden of poverty rests lightly upon their shoulders. Only that the pursuit of happiness begins and ends not in the marketplace, but in the community center, where relationships are a more valuable form of currency. Even though I’ve slowly learned this during my time here, and I’m standing in the midst of healthy, laughing boys, I still can’t help feeling it’s unfair for them to play on swings that have come unmoored from their foundations, shuddering from side-to-side as they swing, in a bizarre dance that threatens to collapse at any moment. Still, they’re as happy as any kids I’ve ever seen, smiling from ear to ear. 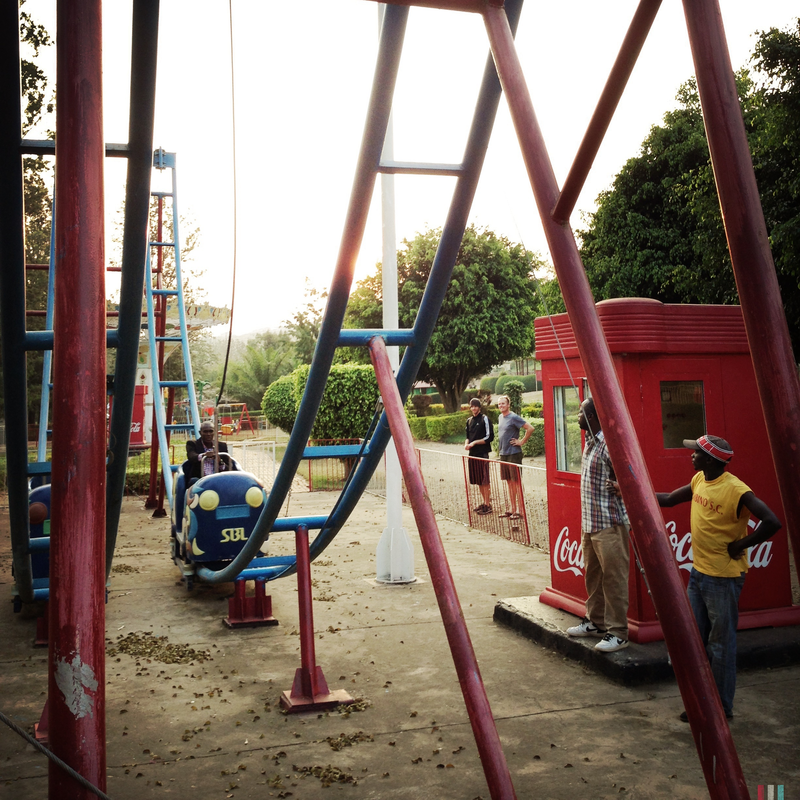 Swing ride at Rwanda’s premiere amusement park. One of the coaches riding the lone roller coaster. He was terrified. 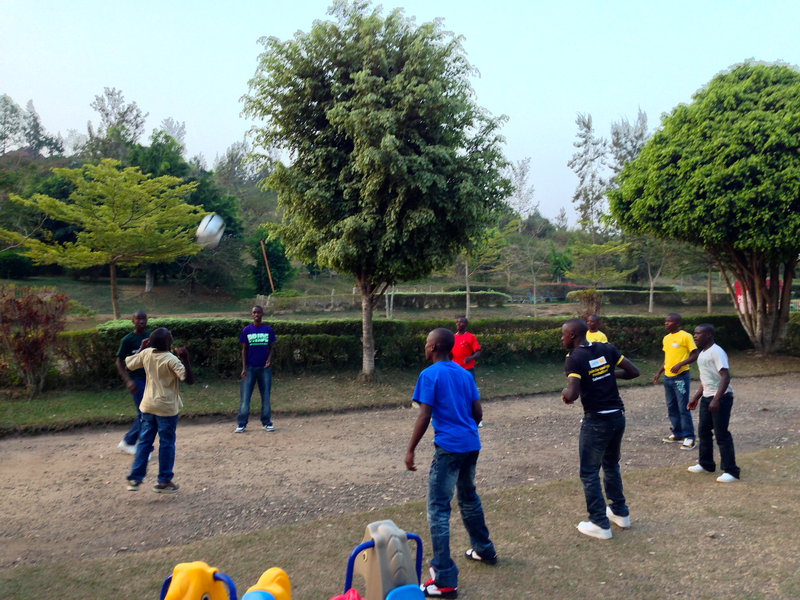 Some of the Heroes Soccer Academy boys playing at their one year anniversary party. We’re in a small 4-door taxi, slowly working our way up a narrow dirt path built for walking, not driving, gradually inching up the side of a banana tree-filled hillside. Singin’ don’t worry / ’bout a thing. ‘Cause every little thing / is gonna be alright. Bob Marley’s relentlessly optimistic voice spills from my small iPad speaker. Drogba sits in front of me in the passenger seat, head bobbing along with the music. I can’t see his face, but I know that he’s smiling—Bob Marley has that affect on him. Drogba has that affect on everyone around him, too. His real name is Isaac, but no one calls him that. If you are at all familiar with international football—which, if you don’t mind my presumption, I’m going to assume you’re not—you would know the source of his moniker. Didier Drogba is a legendary striker from the Ivory Coast, who some call the greatest player to play for Chelsea F.C., one of England’s premier football clubs. Now, I don’t know if the Drogba in front of me will eventually scale those same heights of football stardom, but he definitely looks like his namesake. We finally come to a stop; the car can’t go any further. Jeremy, one of my fellow teachers, Isaiah, Drogba, and I collect the video equipment we’ve brought along. 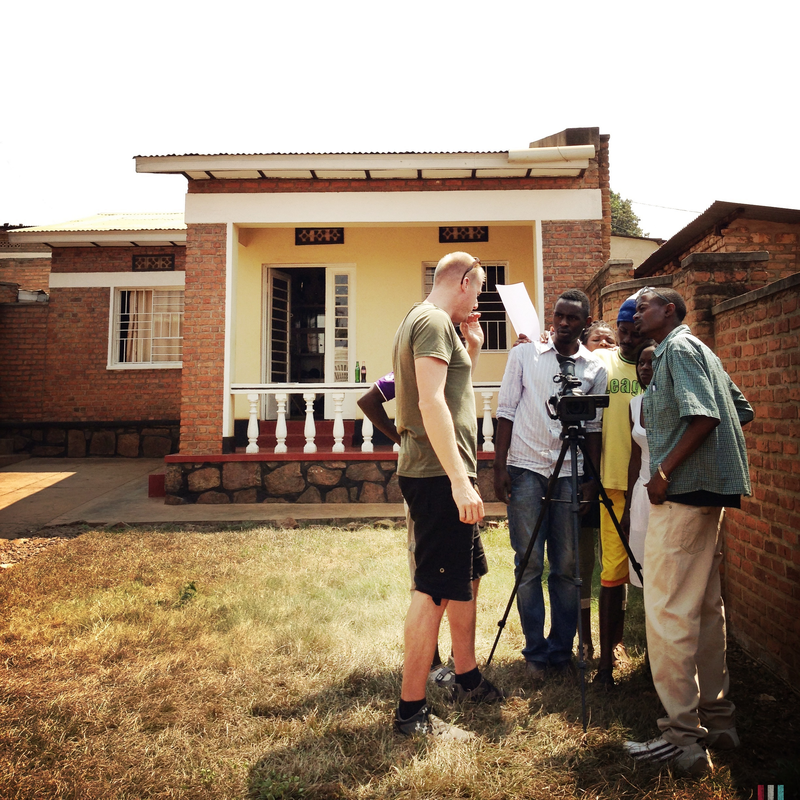 We’re technically here to shoot Drogba’s house for a class project, but Jeremy and I are using it as an opportunity to see the real Rwanda. Up until now, we’ve only seen the modernized part of the country. As we trek along the rest of the way on foot, I’m struck by the beauty around me—the city can’t compete with rolling green hills, filled to bursting with lush vegetation and life. This is more like the Africa I prepared myself for, I’m ashamed to admit, but it’s fuller: it’s simultaneously more joyful and more sorrowful than I expected. We soon reach Drogba’s home, a modest compound of three rectangular mud houses. At the front entrance, I meet one of his younger brothers. He can speak English reasonably well, so he shows me around their place. He points out their goat as it munches on tree leaves; he explains they can only water a small portion of their already tiny garden during the dry season because water is too expensive; and he gives a brief description of how they ferment banana beer in a pit to sell at the local market. He says their 82 year old grandmother is at the market right now, selling what she can. 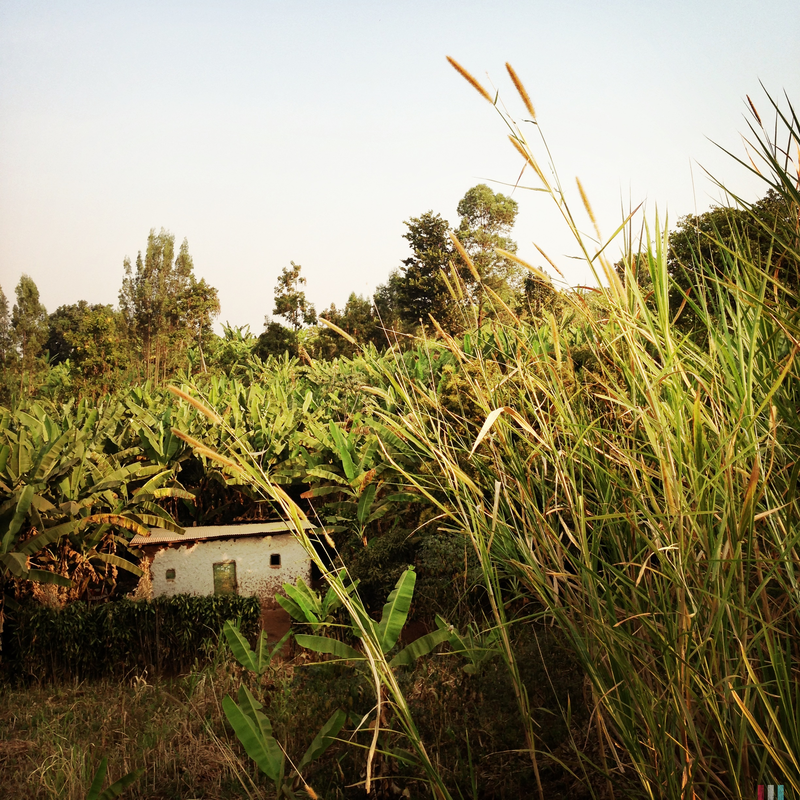 I find out later, that despite all of those banana trees, many in Rwanda’s countryside are starving, because they have to sell everything around them. We’re walking back to our car, when we here a small commotion below us. Drogba’s grandmother is slowly walking up the hill toward us, using a thin wooden cane for support. When she reaches us, she says she was told visitors were at her house, and she rushed back to see us. Jeremy takes out his MacBook and shows her video shot earlier that day of Drogba telling his life story to the camera. When the video ends, she begins telling us her story. How she took responsibility of Drogba and his brothers after their parents were killed in the genocide. How she raised them successfully despite incredibly difficult conditions. How she is still here. And so many are not. A small house tucked into the hillside. Drogba and his younger brother outside of their home. 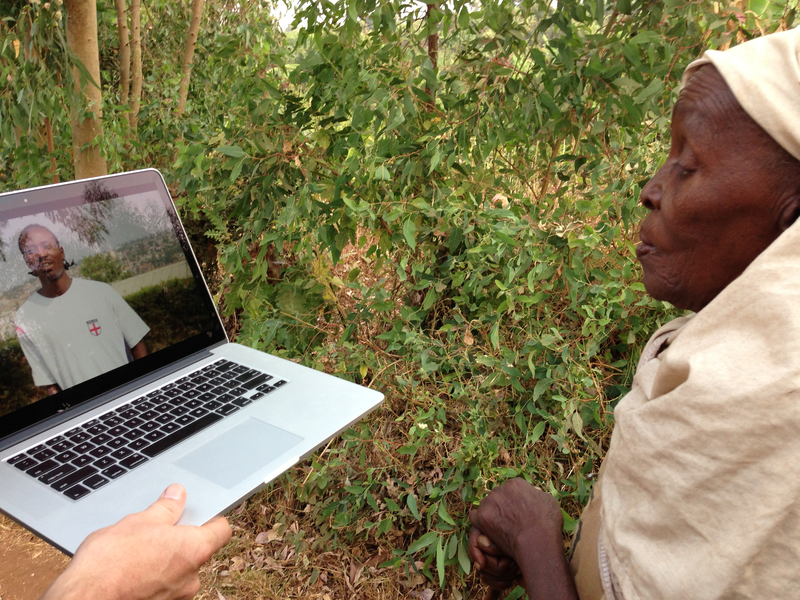 Drogba’s grandmother watching his video project. Pride is a funny thing. It can make you feel like you’ve done something, even when you’ve done nothing at all. Take school pride, for example: I don’t remember playing on the 2005 UNC basketball team, but I remember personally winning that national championship all the same. So, as I watch our students’ completed projects, waves of pride crash into me. And all around me. The entire room is beaming. Our entire group is soaking in their own self-satisfaction, as they should—they persevered through days of arduous training, including 8 straight hours on lighting, and have learned dozens of technical terms that have no direct (or indirect, for that matter) translation in their native language. For a group that couldn’t even open editing software three short weeks ago, let alone use it, their pride is entirely deserved and well-earned. My own pride, though? Eh, not so much. All I did was talk a few hours about telling stories. Jeremy and MJ, the two other teachers in our film group, did far more for the class, imparting the technical knowledge necessary for creating films from scratch. In any case, we only gave them the tools. They built their own vision. Jeremy teaching the group how to operate a camera. After a few minutes of hopeful waiting, I have to face the prospect of a long outage. “You can always take a bucket shower,” my wife helpfully points out. I think I hear a slight smirk in her tone, but it’s probably morning grogginess. Maybe. For the blessedly uniformed, a bucket shower works like it sounds: grab a bucket, fill it with water, and voilà. The particularly needy (i.e. me) who want a hot bucket shower can add a pot of boiled water. Brian and I outside of the Play for Hope offices. 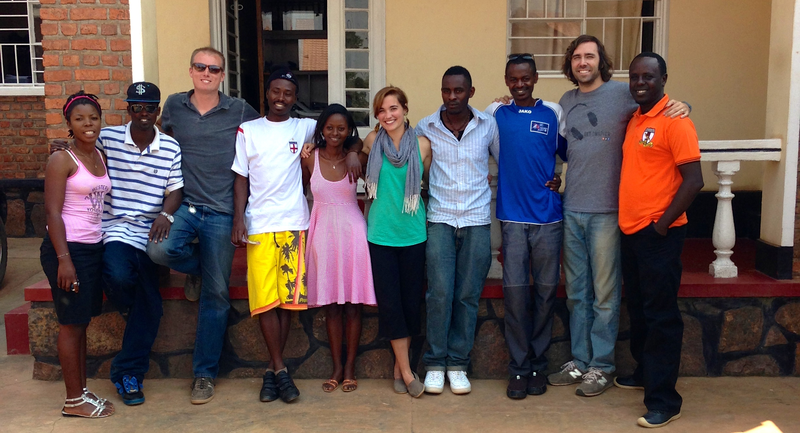 The entire Play for Hope Film team, plus Serieux, Play for Hope’s Rwandan director, on the far right. A few days after arriving, I’m walking back to the house from the office with MJ and Jeremy—a healthy distance I’ve yet to traverse on foot. 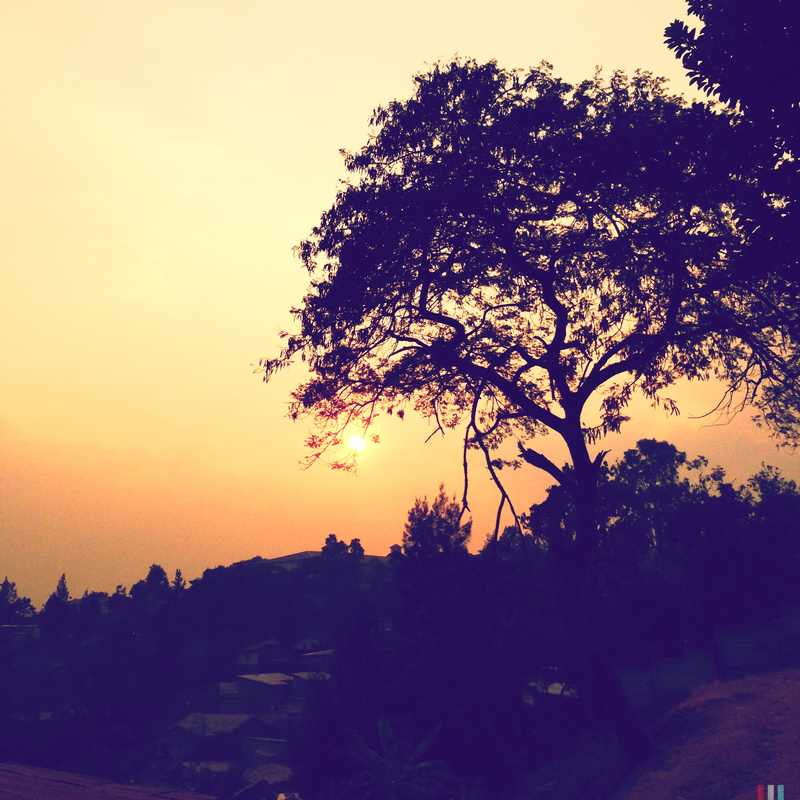 As we walk over the gradually sloping hills of Kigali, the sun sets over our shoulders, draping the modest homes and sparse vegetation in the same burnt orange as the dusty dirt road under our feet. My companions and I stop every hundred feet or so to take photos of the city in the dwindling evening light. Our pace soon slows to a crawl, as every turn in the road reveals a new wonderful sight: a curved tree hanging over the hill’s edge, arcing toward the shrinking sun; a bright aqua-blue gate beside dust covered red bricks; hundreds of broken soda bottles fixed atop exterior walls, their lovely glow sending a picturesque warning to would-be intruders. While we stand in the middle of the road, a small group of young students in pale green uniforms step around us. MJ and Jeremy focus on their cameras and I concentrate on the iPhone in front of my face. They excitedly talk between each other for a short distance until one of them, a round-faced preadolescent boy, turns around and catches my attention with a friendly gaze. “Rwanda? Yes. It is very beautiful,” I reply. His smile widens, brightening his boyish features. “Thank you,” he says contently. Satisfied, he nods his head, turns back around and walks off, laughing with his friends. *Play for Hope Film is currently using donated video equipment to work on a couple of sports documentaries. To properly begin their professional careers, they are in need of complete video kits. The sooner they can get the kits, the sooner they can start generating business. If you’d like to partner with them financially, or if you just want to learn more about the program, you can go here. A little will go a long way.